Discussion in 'Downhill & Freeride' started by mandown, May 8, 2008. Are the "comp" tires done for 2008? The website only shows the "A/T". seems like the same tires to me. edit, i cant find the mud 3. Anyone recommed a good UST Michy for SoCal trail use? A cut 16 in the front and a stock/cut 24 in the rear. cutting the 16 keeps the knobs from folding over as much. I'm a self-confessed weight weenie, but I still love the 32 even though it weighs in at 1400g+. As for Comp VS AT, I thought we agreed nothing had changed other than the name and the sidewall writing? Was thinking of running those as well. What size you running on your 6POINT? Just mounted some Michy's up tubeless for the first time and was surprised how easy it was. Thinking I should convert my trail bike as well. Anyone ever run a DH16 at Mammoth on the rear? Seems likes the huge knobs would dig in the kittie litter really well. So the 32 is a pretty decent choice for big rock? How about a course with loose, chunky granite, rolling, sharp baby-heads, gravel, and fluffy loam over tree roots and boulders???? I'm running 2.2 DH16s right now, and I think they'll do OK on that course, but I'm scared of any of the hardpack trails in the area and don't want to cut my 16s as they're perfect for 90 percent of the trails I run on a reg basis. I'm running Hutchinson Barracuda's on both trail (2.3 F&R)and DH (2.5F, 2.3R) bikes, but they're not UST specific, need to use Stan's. In my experience, comp16's and 32's are good, but the 32's are huge and heavy, not a trail tire and the 16's seem to have really soft lugs that wear really quickly. Don't get any Maxxis 42ST compound tire for the rear. They literally vanish before your eyes. Michy's grip just as well if not better and last easily 3-4x longer. Oh and don't worry about losses from cutting your 16. In cut form it is just as good on loose stuff as before, but significantly better on hardpack. win-win situation. What do you guys use to cut your DH24's? Wire cutters, garden sheers? I've been looking into Hutchinson's as well. From what I've read the and what Orven has said the MX casing Hutchinson's are UST capable. Have you tried mounting them without Stans? How is the rolling resistance of the Barracuda's on your trail bike? Hey Nags, I've got Barracudas on both of my bikes. I'm running 2.5 MX casings on the DH bike tubeless w/ Stan's kit. and 2.3 single ply's w/ tubes on the mini dh. rolling resistance isn't bad, they look like a tank tread but actually roll great. Do NOT run the low rebound rubber as a rear tire though, way too soft! I'm using the 2.2 comp 16 on the rear of my Bullit with excellent 100&#37; results! I have more comp 24's in 2.2 after that i'm sure will work glorious. how are michelins for riding in the east, ie diablo plattekill snowshoe, stuff like that? 32 front 24 rear i was thinking? Anyway High/Med Barracuda for dust would be great imho. Note: for the most powerful braking, mount opposite the tire's molded-in directional arrows. For more speed and progressivity, run consistent with directional arrows. What I don't get is, how the speed of the tyre is faster when it's mounted opposite to the rolling pattern of a Highroller. Shouldn't the ramped edges in the middle cater for faster rolling if mounted like a Highroller? As for better braking it's easy to understand, and as for the "progressivity" I guess they mean that one has to start braking earlier and smoother with the ramped side being faced towards the front (when contacting the ground). Am I correct here? What about for best traction, if the tyre is mounted as the arrows show? Don't the square edges of the middle knobs dig in better, than the ramped "Highroller" sides knobs? Better traction equals higher rolling resistance, don't it, then from where does the "more speed" come from? I used to run the Comp16 as front and the Comp 24 as rear back in 2003-04, both uncut, but all I can remember is the 16's poor side knobs on hardpack, and the 24's bad mud shredding. Loved the 32 I used in the front for a while, though. Right now I'm looking for an agro trail tyre and was thinking of the single ply 2.35" Highroller ST, F&R. Should be great with a weight around 830-850gr, a thread pattern that works in soft/muddy conditions too, and rolls fast. 855gr in 2.5" mode! But will it last longer than a SuperTacky? Looks like a regular DH24, so will it do any good as a front tyre? I'm prepared to invest in a real tyre cutter thingie (~$70 I belive I seen), to cut away the small intermediate side knobs, but how good is the straight line and cornering stability (judging its resemblance to the DHR)? Will that other cut of the single big center knob fix that? Lots of questions, where to start?? Mich is french first and foremost, and that should tell you that they are a little 'odd'! The arrow is the direction of traction. For breaking (like DH) run opposite of arrows, period. They will be faster this way as well!!!! If you want acceleration traction, turn the rear tire in the direction of the arrow for foreward traction. I would agree with you, the 16 only likes soft terrain where the side knobs can sink into the terrain and grab, yet on the other hand, 24 knobs are thight and pack up easily! Mich needs drastically to offer some different treads.....yet with a little effort, you can perform that duty for them...for intermediate terrain (between 16 soft, and 24 hard pack) use a 24 and cut the intermediate treads..the ones every other side knob. this will give you mreo side grip and better clearing than a stock 24, yet no 'fold over' like th 16. The extreme tire is not a DH tire. Mich uses the same tread as the 24 (they have for years actually) yet they use a much harder non-sticky rubber as you would find on a typical XC tire. If you want the traction of a 'DH' tire, buy a DH tire compound, I think you will find the Mich tires to last a good bit longer than the comparable maxxis tires. You need to decide your priorities, as no tire will offer everything. Do you want braking traction, cornering traction, wet traction, light weight, low rolling resistance, durabity, flat/rim protection?????? You are asking a lot of very broad questions that dont have an answer (or answers) untill you decide what YOUR priorities are. Bloody hell, all of my reply got erased when I closed this browser down to be able to stream better. Thought this browser handled that so cool uptil now.. Will reply later, gotta go out in this magnificent sun! Dave P, to cut the side knobs, what did you use, and is it the bigger side knob or the smaller ones that you are cutting? It's the inner one out of those side knobs that are two and two. I don't know of any cutting on the Comp32!! This cutting that I described was solely for the Comp24! Do a search in this forum, like "michelin 24 cut" or something similar, and you'll find the pics. There's also a cut fo rthe DH16 that you'll find then. Yeah I know, forgive my curiousity, it's the in me. I'll try to be a bit more clear what my Q's are this time. I'm not convinced to write the Frenchies of completely just because they're odd. They must know something we don't, it's not out of luck that they've been prooven one of the worlds best tyre manufacturers. To understand which way the tire should be mounted for best braking or climbing capacity, is easy. As for "progressivity", they used to call it "pregressive braking", and I belive they mean that you'll have to ride smoother if you can't panik brake. What I don't get is that they claim "more speed" if you mount it as the arrow tells you to. More speed because of better traction? Shouldn't the traction be better if the knobs hit the soil with a square edge (as they do if you mount it after the arrow), than if you turn the tyre around like a Highroller and let the ramped edges hit the soil? How did the pro's run them back in the 90's? Maybe someone of the sponsored guys in this forum can tell us, if they were given any propper info on this matter. FC Linder? Thing is that I've read in this forum that the ST tyre is made out of 42a rubber all the way through. While the SR is a 60a tyre with a 40a coat on, and that's why it lasts better than the ST.
OK, so it's somewhere around 60a. They are confusing their customers with their site as the "Mountain X'Trem" is shown with their DH stuff. A good thing with Maxxis is that they tell what compound they are using (and so is quite a lot of manufacturers today), while Michy isn't.. I want it to be 2.5" (or at least 2.3") single ply tyre for agressive trail/light DH, around 850-950gr, sticky rubber (to work when wet), and with a pattern for dry to semi muddy. A cut single ply Comp24 could work (and they're on sale on CRC, but the rubber must be old as they went out of production some time ago). That's why I was thinking of a 2.35" (they don't come in 2.5") single ply Highroller in SuperTacky. It would be perfect, I thought until I remembered the poor life span of the SuperTackys. Are you absolutely positively sure beyond doubt that the Mountain X'Trem has XC rubber and not anything softer? Yea the cut is for the 24 to give better cornering traction and let the tire clean a bit better. Cut the inner side knob (it is on every other side knob...kind of a double knob...just remove the inner half). I use a pair of very sharp garden scissors, but side or end cutters will work as well....or just a razor blade if you are careful. I wouldn't run heavier tyres than needed. Rims, tubes and tyres are the three most important things to have light on a bike, if you want it to be more fun and responsive. A light fork is next. Can't help you from where to buy though, as I'm on the veggie side of the world. My issue with mich is that they dont explicitly state the rubber used in any tire, so you cant tell if a tire is going to be sticky or not. I have come to believe that the ONLY sticky tires from mich are the DH (now A/T) tires, even though several other lighter tires are advertised as having 'soft' rubber. If you look under the DH tires tech info, they have what mich calls DHCS 'down hill compound soft' rubber. I think this is French for sticky rubber and only the DH tires are shown to have this feature. The only maxxis tire that has differing rubber compounds that I am aware of is the 3C...it has a 60 core with both 42 and 40 over the top. They seem to hold up pretty well. I cant think of a tire from either mich or maxxis that is lighter, single ply, sticky rubber, and 2.5"......seems that al the tires that are both that big, and have sticky rubber, are full on DH tires. I have heard some good things about the big bettys from schwalbe, but I have no personal experience with them. They come on several dorometers and are ~ 900g I think. I would be stoked if there were more options out there in this kind of tire. 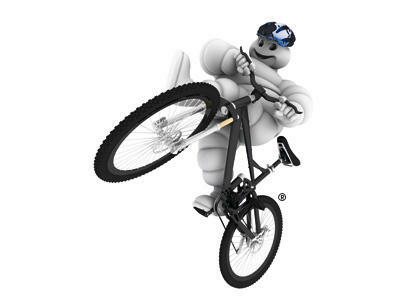 Michelin changed naming to the DH A/T series back in 2005. Any place using any other name is selling the older versions or never bothered to update their web site, catalog, etc. Do you have a link for the 2.35" single ply super tacky minion dhf's? not a retailer link off the top of my head (maybe try go-ride), but BTI shows them: http://www.bti-usa.com/public/category/TR/TRTS/MA/MA204?page=1#MA204 and any LBS can order from them. Will check out the Bettys for sure, thanks.